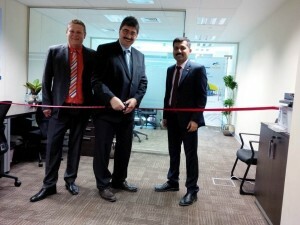 Dubai, UAE: – German-based water treatment specialist EnviroChemie has officially opened its new sales office in the United Arab Emirates, bringing its high technology ‘Made in Germany’ systems and services closer to new customers in the Middle East, North Africa and South Asia (MENASA) region. The official opening of the new Dubai office by Gottlieb Hupfer, CEO of EnviroChemie, coincided with the WETEX environmental trade fair in Dubai, which provided opportunities to initiate a range of new projects with customers, and to discuss already commissioned projects in detail. Robin Steinsdorfer, Managing Director of the local subsidiary EnviroChemie FZE, and Visakh John Thomas, who will head the new office, led the ribbon-cutting ceremony. EnviroChemie has been supplying selected industries in the region with its high-technology “Made in Germany” modular water and wastewater treatment systems for over a decade. Now the newly opened Dubai office will improve local service and consultancy capacities. EnviroChemie can now provide the states of the Gulf Cooperation Council, GCC, with its entire product range in plant engineering for water and wastewater technology in industrial applications. These include customized and modular Envochem plants for physico-chemical treatment, the Biomar series for biological treatment, Flomar flotation plants and Envopur membrane plants. Click on EnviroChemie cuts ribbon to open new Middle East bureau for other information. Photo: From left: Robin Steinsdorfer, Gottlieb Hupfer and John Thomas Visakh prepare to cut the ribbon opening the new EnviroChemie FZE office in Dubai.